With their sophomore release „Two Carrion Talismans“ VALDRIN showed an unusual type melodic black metal: Apart from the subdued keyboards the album sets itself apart through its own mythological storyline. In the following interview with frontman Carter Hicks you can read more about the concept of the record, its conciously raw production and the specific characteristics of the music. In VALDRIN you basically play melodic black metal. What do you think is the most significant aspect of your music that makes it something special? I’m not sure if we are a melodic black metal band or not. We’re all certainly fans of the mid 90’s Swedish bands like Dissection, Dawn, Sacramentum, Unanimated… etc but there’s a lot of other influences and sounds that we bring into our music. If there is anything about our music that makes us stand out, maybe its the fact that our albums are very dynamic and cover a lot of different moods. Another aspect would be the lyrics of the ‚Ausadjur Mythos‘, as we call it. I would at least hope that people read the lyrics and find the story interesting. Which bands and artists would you name if you were asked about your musical role models? Bands such as Bathory, Peste Noire, Dissection, Manes, Mütiilation, Destruction, The Chasm, Order From Chaos, Morbid Angel, were bands that changed my opinion of music and guitar playing. Also, the music of Nobuo Uematsu and Pink Floyd have been a part of my life from the beginning. With your new album „Two Carrion Talismans“ you tell the story of your very own protagonist VALDRIN. Can you summarize what it is about? Sorry, I have to correct you, this album is actually about the antagonist Nex Animus and his creation of the Orcus underworld, where the events that lead up to ‚Beyond The Forest‘ later take place. So yes to be clear, this album is a prequel to ‚Beyond The Forest‘ and is solely about Nex. The story begins in prehistoric times at the end of Nex’s earthly life when he has slit his own throat after slaying his twin brother in front of a tribe of their kin. Unknown to the world, these two brothers are the first beings born with a ‚Spirit Genome‘, one made up of dark energy, and one of light. The aftermath of this conflict is the creation of two afterworlds, the dark world being the Orcus, and the light world being the Aurae. After his death, Nex awakens in the vacant domain of the Orcus, there he is visited by a mysterious force of the universe known as the Ausadjur, who brand him with the name ‚Nex Animus‘. These spirits bestow a divine edict of law upon him and introduce him to the domain he will rule for eternity. Though after centuries of meditation and overseeing the Orcus, he communicates with another unknown force from the deep cosmos and is informed of a clandestine key to fool the Ausadjur gods and escape into the universe at the moment of the apocalypse. There’s a lot more to be found in the lyrics. How important are the lyrics to you compared to the music itself? The lyrics are equally as important. The concept of each album dictates how we write the music together, and then the music, in turn, tells me what’s happening in the story and I try to write these abstract ideas in some sort of understandable way. Your stories contain influences from different mythologies, right? Which ones did play a part in the creation of your fictional world and in which way were you influenced by them? A lot of stuff is inspired by the Sumerian, Egyptian, Greek, and Roman mythologies. There are some eastern concepts mirrored in the ‚Ausadjur Mythos‘, but to a much lesser extent. There is, of course, a lot of inspiration from western occultism. Some examples of these inspirations would be the word ‚Orcus‘ which many know is also the Roman equivalent of Hades or the underworld. Others would be the event we call the ‚Junnatox‘ which mirrors many ancient religious conflicts from Set and Osiris, to Cain and Abel. 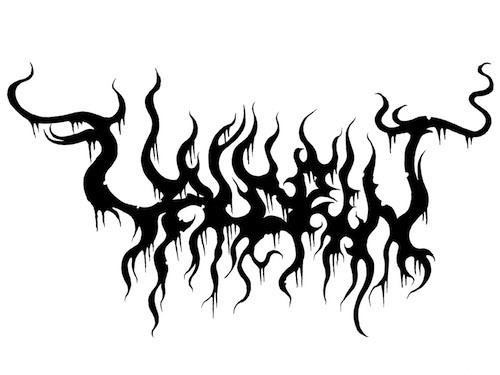 The god known as Wyrmuul or the ‚Serpent Willow‘ is our representation of Lucifer. However, most of these connections are made after the story of each album is finished. It mostly all comes from my imagination, but if one is to believe in the collective unconscious, sometimes we are all channeling and manifesting visions from our ancestors. But most of us are unaware of this anyway, and I don’t always think about it when writing the music/lyrics. How did you come up with the idea of not simply singing about conventional themes, but instead creating your own fictional world? It wasn’t intentional in the beginning. All of the music and most of the lyrics for the debut album ‚Beyond The Forest‘ were created before we had the ‚Ausadjur Mythos‘. Originally the lyrics came from visions of a dark underworld I had in my mind. It wasn’t until I assembled the songs in order for the first album that I realized it was telling a profound story. Afterward, I wrote the song ‚Beyond The Forest‘ and that was when the whole mythos appeared to me and I knew it was what our music was going to be based on from then onward. Are you considering to deal with other subjects in your lyrics at some point or do you still have many stories to tell from your own fictional world? There will be many works in the ‚Ausadjur Mythos’ coming in the future. 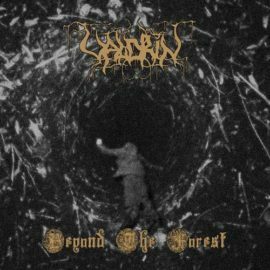 The story of Valdrin, beginning with ‚Beyond The Forest‘ will be part of a trilogy of albums that we will return to someday. The story will undoubtedly end someday as well, and I haven’t thought about what will happen afterward. Your new album is noticeably shorter than your debut „Beyond The Forest“. Is there a reason for that? We originally intended ‚Two Carrion Talismans‘ to be an EP but after we had immersed ourselves in the concept, we knew the character Nex needed a full-length album to tell his story. From the beginning, we knew it was going to be a shorter and more traditional album approach in its structure/length. In which way do you think that you have made progress as a band compared to your debut? The music for the new album is eviler, heavier, faster and invokes a much darker atmosphere. I also believe it flows a lot better than the debut and achieves an equally compelling story with much less duration of time. The track „Sinews Of Blood And Vein“ was already released online in advance. Why did you choose this particular song to give a first impression of the album? We chose the song because it crushes, its the shortest song, and also reveals the least of what the rest of the album entails. 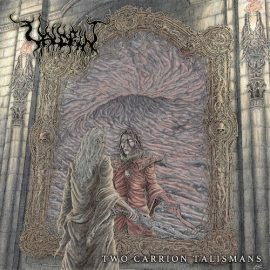 In contrast to many other albums in symphonic and melodic black metal, which have a rather polished production, „Two Carrion Talismans“ sounds quite rough. Is this what you intended and if so, for what particular reason? The production for the debut album was too clean, and we wanted something more organic sounding but still powerful. I don’t think we sound very ’symphonic‘ myself. Almost all of the synth sounds you hear are actually guitar-synth sounds done with a Roland GR-20. We use primitive synth sounds because it creates a nostalgic, older sound to our ears. I certainly don’t consider us in the same category as most symphonic black metal bands. The sounds we use are more primitive and subdued. The artwork looks pretty interesting. Who created it and what is shown on the picture? It was created by our friend Lucas Ruggieri, who is one of my favorite artists in the world today. The album cover depicts Nex in the foreground and his vision of himself in the reflection. It demonstrates what I believe are the two archetypes of a villain: one that is created through a past trauma or perceived injustice, and one that is evil from birth, written in the DNA and the ‚Spirit Genome‘. Nex sees himself in the reflection as a grandiose regal god of evil, whose only destiny is to destroy, though in the foreground you see a feeble old man, who bears the scars from his past torments. The ‚Two Carrion Talismans‘ are the dead eyes of the wolven blade he is brandishing. The album cover and the title both reflect the theme of duality. What about live shows? Could you imagine playing shows in Europe as well sometime in the future? We are currently making plans to play as far across the U.S.A. as we can. Playing in Europe is a huge dream of ours, we hope that our label Blood Harvest, can help spread our music in Europe. What else is planned next for VALDRIN? Do you already have an idea what you want to do on your next record? At the moment, we are working on a mini-lp which will be a side story taking place between the events of ‚BTF‘ and ‚TCT‘ and the final tale set in the Orcus. It will be the most solidified concept we’ve ever created and by far the darkest, scariest, and most hateful. Now I would like to go through our traditional Metal1.info-Brainstorming with you. What comes to your mindwhile reading the following terms? VALDRIN in five years: Goals achieved, new realms conquered. Thanks for the interview, hails to all those who have shown their support for ‚Two Carrion Talismans‘. Mit „Two Carrion Talismans“ haben VALDRIN ein Melodic-Black-Metal-Album der etwas anderen Art veröffentlicht: Neben dem subtilen Einsatz der Keyboards zeichnet sich die Platte auch durch den eigens dafür geschaffenen Mythos aus. Im Interview mit Frontmann Carter Hicks könnt ihr mehr über das Konzept des Albums, dessen bewusst raue Produktion und die besonderen Charakteristika der Musik lesen. Mit VALDRIN spielst du melodischen Black Metal. Was ist deiner Meinung nach ein Charakteristikum, das eure Musik zu etwas Besonderem macht? Ich bin mir nicht sicher, ob wir eine Melodic-Black-Metal-Band sind oder nicht. 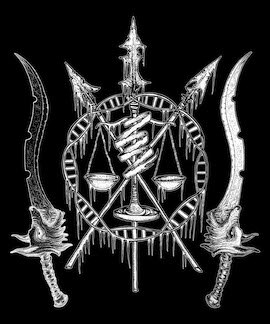 Wir sind allesamt Fans von schwedischen Bands wie Dissection, Dawn, Sacramentum, Unanimated usw., aber es gibt viele andere Einflüsse und Sounds, die wir in unsere Musik einbringen. Wenn es etwas an unserer Musik gibt, das uns auszeichnet, dann vielleicht die Tatsache, dass unsere Alben sehr dynamisch sind und viele verschiedene Stimmungen abdecken. Ein weiterer Aspekt wären die Texte des „Ausadjur Mythos“, wie wir es nennen. Ich würde zumindest hoffen, dass die Leute die Texte lesen und die Geschichte interessant finden. Welche Bands und Künstler würdest du benennen, wenn man dich nach deinen Vorbildern fragt? Bands wie Bathory, Peste Noire, Dissection, Manes, Mütiilation, Destruction, The Chasm, Order From Chaos, Morbid Angel sind Bands, die meine Meinung über Musik und Gitarrenspiel geprägt haben. Auch die Musik von Nobuo Uematsu und Pink Floyd war von Anfang an Teil meines Lebens. Mit eurem neuen Album „Two Carrion Talismans“ erzählt ihr die Geschichte eures Protagonisten VALDRIN weiter. Könnt ihr uns kurz zusammenfassen, wovon es handelt? Sorry, ich muss dich korrigieren, dieses Album handelt eigentlich von dem Antagonisten Nex Animus und seiner Schöpfung der Orcus-Unterwelt, wo die Ereignisse, die zu „Beyond The Forest“ führten, später stattfinden. Also ja, um das klarzustellen, dieses Album ist die Vorgeschichte zu „Beyond The Forest“ und handelt ausschließlich von Nex. Die Geschichte beginnt in prähistorischen Zeiten am Ende von Nex‘ irdischem Leben, als er sich die Kehle durchschnitten hat, nachdem er seinen Zwillingsbruder vor einem Stamm ihrer Sippe getötet hat. Diese beiden Brüder, die der Welt unbekannt sind, sind die ersten Wesen, die mit einem „Geistergenom“ geboren wurden, von denen eines aus dunkler Energie und eines aus Licht besteht. Die Folge dieses Konflikts ist die Schöpfung von zwei Nachwelten, wobei die dunkle Welt Orcus und die helle Welt Aurea ist. Nach seinem Tod erwacht Nex im desolaten Reich des Orcus, dort wird er von einer mysteriösen, universellen Kraft namens Ausadjur gefunden, die ihm den Namen „Nex Animus“ verleiht. Diese Geister verleihen ihm göttliches Recht und führen ihn in das Gebiet ein, das er für die Ewigkeit regieren wird. Nach Jahrhunderten der Meditation und der Überwachung des Orcus kommt er mit einer anderen unbekannten Kraft aus dem tiefen Kosmos in Kontakt und erfährt von einem geheimen Schlüssel, mit dem er die Ausadjur-Götter zu täuschen und im Moment der Apokalypse ins Universum zu fliehen vermag. Es gibt aber noch viel mehr in den Texten zu entdecken. Wie wichtig sind dir die Texte im Vergleich zur Musik selbst? Die Texte sind ebenso wichtig. Das Konzept jedes Albums bestimmt, wie wir die Musik zusammen schreiben, und dann erzählt die Musik wiederum, was in der Geschichte passiert, und ich versuche, diese abstrakten Ideen in irgendeiner Weise nachvollziehbar zu schreiben. Eure Geschichten beinhalten Einflüsse von verschiedenen Mythologien, richtig? Welche sind das zum Beispiel und inwiefern habt ihr euch daran orientiert? Viele Dinge sind von den sumerischen, ägyptischen, griechischen und römischen Mythologien inspiriert. Es gibt einige östliche Konzepte, die sich im „Ausadjur-Mythos“ widerspiegeln, aber in viel geringerem Ausmaß. Natürlich beziehen wir eine Menge Inspiration aus westlichem Okkultismus. Einige Beispiele für diese Inspirationen wären das Wort „Orcus“, von dem viele wissen, dass es auch das römische Äquivalent des Hades oder der Unterwelt ist. Andere wären das Ereignis, das wir Junnatox nennen, das viele alte religiöse Konflikte von Set und Osiris bis Kain und Abel widerspiegelt. Der Gott, der als Wyrmuul oder die „Schlangenweide“ bekannt ist, ist unsere Darstellung Luzifers. Die meisten dieser Verbindungen werden jedoch erst hergestellt, nachdem die Geschichte eines jeden Albums abgeschlossen ist. Es kommt meistens alles aus meiner Vorstellungskraft, aber wenn man an das kollektive Unbewusste glauben will, kanalisieren und manifestieren wir manchmal alle Visionen unserer Vorfahren. Aber die meisten von uns sind sich dessen sowieso nicht bewusst, und ich denke nicht immer daran, wenn ich die Musik und Texte schreibe. Wie seid ihr auf die Idee gekommen, nicht einfach über herkömmliche Themen zu singen, sondern eine eigene fiktive Welt zu kreieren? Am Anfang war es nicht bewusst. Die gesamte Musik und die meisten Texte für das Debütalbum „Beyond The Forest“ entstanden, bevor wir den „Ausadjur Mythos“ kreiert haben. Ursprünglich stammten die Texte aus Visionen einer dunklen Unterwelt, die ich im Kopf hatte. Erst als ich die Songs für das erste Album zusammenstellte, wurde mir klar, dass es eine tiefgründige Geschichte erzählt. Danach schrieb ich den Song „Beyond The Forest“ und da erschien mir der ganze Mythos vor meinen Augen und ich wusste, dass er das war, worauf unsere Musik von da an basieren würde. Ziehst du in Betracht, irgendwann auch andere Themen in euren Texten zu behandeln oder habt ihr noch viele Geschichten aus eurer fiktionalen Welt zu erzählen? In Zukunft wird es viele Werke, die aus dem „Ausadjur Mythos“ herrühren, geben. Die Geschichte von Valdrin, beginnend mit „Beyond The Forest“, wird Teil einer Trilogie von Alben sein, auf die wir eines Tages zurückkommen werden. Die Geschichte wird zweifellos auch eines Tages enden, und ich habe nicht darüber nachgedacht, was danach passieren wird. Euer neues Album ist merklich kürzer als euer Debüt „Beyond The Forest“. Hat das einen bestimmten Grund? Ursprünglich wollten wir mit „Two Carrion Talismans“ eine EP machen, aber nachdem wir uns in das Konzept vertieft hatten, wussten wir, dass der Charakter Nex ein ganzes Album benötigte, um seine Geschichte zu erzählen. Von Anfang an wussten wir, dass es sich bei dem Album um einen kürzeren und traditionelleren Ansatz hinsichtlich Struktur und Länge handeln würde. In welchen Aspekten habt ihr euch deiner Meinung nach als Band gegenüber eurem Debüt weiterentwickelt? Die Musik für das neue Album ist ekliger, heavier, schneller und erzeugt eine viel dunklere Atmosphäre. Ich glaube auch, dass es einen viel besseren Fluss als das Debüt hat und eine ebenso überzeugende Story in kürzerer Zeitdauer erzählt. 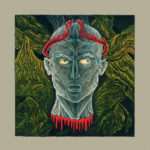 Den Track „Sinews Of Blood And Vein“ konnte man sich bereits vorab online anhören. Warum habt ihr gerade diesen Song als Vorgeschmack ausgewählt? Wir haben den Song gewählt, weil er eine richtige Abrissbirne ist, er ist der kürzeste Song und enthüllt auch das Wenigste von dem, was der Rest des Albums mit sich bringt. Im Gegensatz zu vielen anderen Alben im Symphonic und Melodic Black Metal, die ziemlich aufpoliert klingen, ist „Two Carrion Talismans“ recht schroff produziert. War das so bewusst von euch beabsichtigt? Die Produktion des Debütalbums war zu sauber und wir wollten etwas Organischeres, aber dennoch Kraftvolles. Ich glaube nicht, dass wir allzu „symphonisch“ klingen. Fast alle Synthesizer-Sounds, die man hört, sind eigentlich Gitarren-Synthesizer-Sounds, die mit einer Roland GR-20 gemacht wurden. Wir verwenden primitive Synthie-Sounds, weil sie in unseren Ohren einen nostalgischen, älteren Klang erzeugen. Ich sehe uns sicherlich nicht in der gleichen Kategorie wie die meisten sinfonischen Black-Metal-Bands. Die Klänge, die wir verwenden, sind primitiver und dezenter. Das Artwork sieht ziemlich interessant aus. Wer hat es kreiert und was ist darauf abgebildet? Es wurde von unserem Freund Lucas Ruggieri entworfen, der heute einer meiner absoluten Lieblingskünstler ist. Das Cover des Albums zeigt Nex im Vordergrund und seine Vision von sich selbst in der Reflexion. Es zeigt, die beiden Archetypen, die meiner Meinung nach einen Bösewicht ausmachen können: einer, der durch ein vergangenes Trauma oder eine wahrgenommene Ungerechtigkeit geschaffen wird, und einer, der von Geburt an böse ist, aufgrund der DNA oder des „Geistergenoms“. Nex sieht sich in der Reflexion als grandioser königlicher Gott des Bösen, dessen einzige Bestimmung es ist, zu zerstören, obwohl man im Vordergrund einen schwachen alten Mann sieht, der die Narben seiner vergangenen Qualen trägt. Die „Two Carrion Talismans“ sind die toten Augen der Wolfsklinge, die er schwingt. Sowohl das Albumcover als auch der Titel spiegeln das Thema der Dualität wider. Wie sieht es bei euch mit Live-Shows aus? Könntet ihr euch vorstellen, auch mal Shows in Europa zu spielen? Wir planen derzeit, so viel wie möglich in den USA zu spielen. In Europa zu spielen ist ein großer Traum von uns. Wir hoffen, dass unser Label Blood Harvest dazu beitragen kann, unsere Musik in Europa zu verbreiten. Was ist sonst noch als nächstes für VALDRIN geplant? Habt ihr schon eine Idee, was ihr auf eurer nächsten Platte umsetzen wollt? Im Moment arbeiten wir an einer Mini-LP, die eine Nebengeschichte zwischen den Ereignissen von „Beyond The Forest“ und „Two Carrion Talismans“ und die letzte Geschichte im Orcus sein wird. Es wird das dichteste Konzept sein, das wir je geschaffen haben, und bei weitem das düsterste, furchterregendste und hasserfüllteste. Nun würde ich mit dir gerne noch unser traditionelles Metal1.info-Brainstorming durchgehen. Was fällt dir zu den folgenden Begriffen ein? Comics: Bin kein Fan davon. VALDRIN in fünf Jahren: Ziele erreicht, neue Reiche erobert. Vielen Dank für das Interview, vielen Dank an alle, die ihre Unterstützung für „Two Carrion Talismans“ bekundet haben.